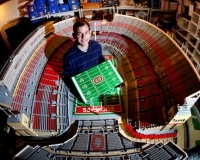 Over at A Look at LEGO podcast, a friend of mine, Paul Janssen was interviewed about building the Ohio State University horseshoe... I haven't seen it in person yet, but I know it's a monster build. I vaguely remember when he announce to the LUG that he was going to build it, so it was nice to reminisce. Thinking about monster LEGO buildings reminded me of a presentation that I gave at BrickMagic '10, on Building Commissions. 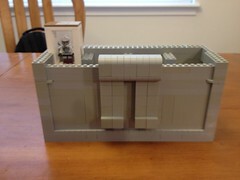 I had uploaded it to BrickBuildr, but under the 'downloads' section, I guess I forgot to add a link -- it's there now. I should update the presentation a little, there's more information I could add, now that we've completed the Miami Children's Hospital build... updated photos of the model, a small picture gallery of source images, a quick snapshot of architecture drawings we used, etc., to give a rough idea of the process we go through for building a large model. It sounds like a similar process Paul went through to build the horseshoe, but he was a one man builder, whereas we had 4 builders. If you're going to be in town for Star Wars Celebration, give us a shout out.